Keep track of your work in progress. Instantly spot bottlenecks. Increase your team productivity. In the Cumulative flow diagram, each coloured area represents a workflow state from the lists in your ZenHub board. The horizontal axis shows the time and the vertical axis shows the number of tasks. The size of the areas indicates how many work items are currently in each state for the selected time period. Pro tip: Strive to keep the work in progress within the limits for each state - this is the key to achieving a stable process. CFD for ZenHub by Nave has advanced chart overlay that shows the number of tasks in progress for the last 6 months. Ideally the line should stay even or go down. Pro tip: If the line goes up, this means WIP goes up and your team is working on more tasks than they are able to handle at a time. Increased WIP usually results in increased cycle times, reduced team efficiency and potential project delays. Keep the line straight! By using the CFD, you can keep track of how much work your team has delivered. If the bottom line of your CFD represents the "Done" state from your process, then the slope of that line between any two points is your average throughput between those two points. A productive and self-organised team will be able to complete tasks quickly and see the "Done" area grow rapidly. Pro tip: Watch out for a flatter gradient in your "Done" area! The slower it grows, the longer your delivery times. 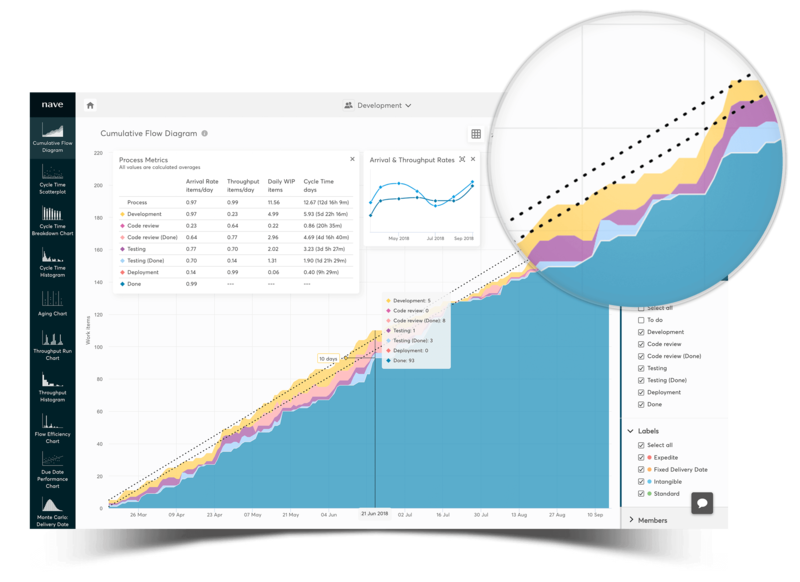 Cumulative flow diagram by Nave gives you an instant insight into the exact amount of work in each stage of your project. If one or more of the areas that represent WIP start expanding it signifies a bottleneck in that state and a problem stemming the workflow. Pro tip: Remember to account for any changes like team size or priorities before jumping to conclusions - these could provide explanations for unexpected spikes in activity. The horizontal difference between the top and the bottom line of a CFD area at any point along the graph is your process's Approximate Average Cycle Time. The comparison of the approximate average cycle time from your CFD with the exact average Cycle Time from your Cycle Time Scatterplot can give you a good understanding of your process performance. Pro tip: If the approximate average cycle time is not close to the exact average cycle time, this means that work items are getting stuck in your process and you are accumulating process flow debt. Implement pull policies between process stages to make sure work items flow smoothly. Cumulative flow diagram enables you to evaluate the efficiency of your flow and help you identify problem areas in order to achieve a stable and healthy process. In a stable system the average Arrival Rate is roughly equal to the average Throughput. This means that the tasks arrive in the process in the same speed as they leave it. Pro tip: Based on Little's Law, Average Cycle Time = Average Work In Progress / Average Throughput. The more accurate the equation, the healthier your process. If the math breaks down for you it is time to take a closer look into your process. Improve your process efficiency with Nave!